Two weeks ago we put the finishing touches on our backyard patio. Our back yard has been, for lack of a better word, a hot hot mess for the last three years. The highlight was last summer when our already gross and muggy backyard got in-ground wasps that prevented us from going outside for a couple weeks. Yes, I said hot mess didn’t I? We dug it all up and put in a huge backyard patio this summer. Now that our girls are getting a bit more independent and our backyard is put back together, this has been the first season we have really been able to enjoy large chunks of time outside the way I’ve always imagined we would when we first purchased our house. I snapped a picture of myself, sitting on our outdoor couch and READING A BOOK while my girls played in the playhouse because I wanted – no needed – to document that this day had come. I’ve waited 15 months for our girls to be able to truly play together like this and it’s finally happening. Sure, I’m breaking up fights and squabbles and re-distributing toys every five minutes but there are true, uninterrupted pockets of time that the girls are enjoying the benefit of a sibling relationship and I can catch a minute or two for myself in the course of the day. The last couple months I fee as if we have finally entered into a new, easier, more enjoyable stage with the girls. Prior to that, I felt like we were in a really difficult stage because Collins wasn’t walking well yet, but was into all the things, crawling everywhere, frustrated she couldn’t walk like Ainsley. I felt as if we continued to try doing fun things only to leave the park or the zoo or the outing totally frustrated by the fact that in theory we were supposed to be having fun but I was feeling frustrated more than anything. And, as with every stage with kids, I reminded myself that if you’re feeling stuck in a not particularly fun stage, just hang around long enough and that, too, will change in the blink of an eye. The last 15 months have been absolutely crazy with two girls, a rapidly growing business, social and personal commitments and more. I’ll be the first to admit that I probably pushed myself too hard this last year. Thinking back to those days with a two-week-old baby in the Rock and Play next to me while I worked in my office? Well, I don’t regret that one bit, but I also look back and can practically remember how TIRED I felt for months on end. About six months into life with two kids we started to find a rhythm that was more enjoyable and manageable than it had been before; we started to see the sun shining a little more with the flexibility and adaptability that a slightly older baby and older toddler provide. But it wasn’t until a couple weeks ago that I really felt my body take a big sigh of relief, letting go of tension and exhaustion that I didn’t even know I was carrying with me. 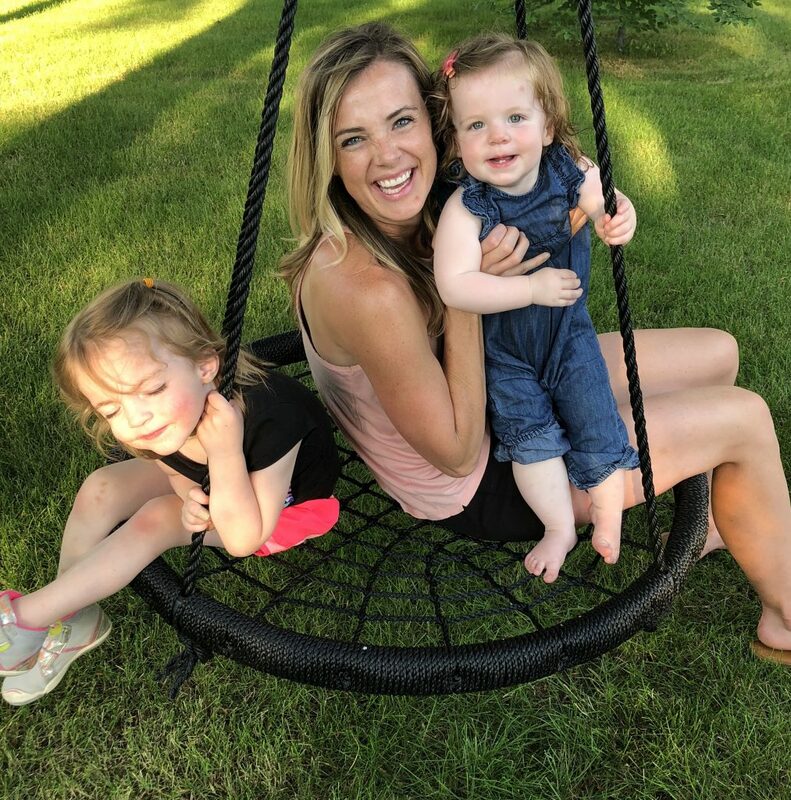 As I watched my girls play and giggle in that playhouse, as I let the sun shine on my face and relax while they played, I realized how very tiring the first year with two was for me and how much happier I am to be in this stage right now with these two little girls. Now that Collins is 15 months old I’ve gotten a good handful of questions about whether/if we plan to have more kids. And I always give the same answer: We hope to some day, but for now I’m just enjoying this stage, this phase, where life feels easier, and more manageable and I have a little bit more breathing room to soak up this stage we are in. Espresso and Cream Behind the Scenes // The Newsletter!